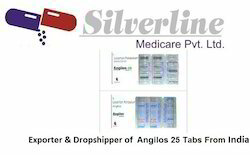 Pioneers in the industry, we offer xmet sr tabs, trajenta, forxiga tablet (dapagliflozin), janumet tabs, januvia tabs and istamet from India. 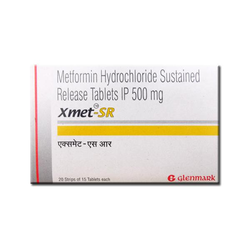 Metformin (originally sold as ) is an oral anti-diabetic drug. It is the first-line drug of choice for the treatment of type 2 diabetes, particularly in overweight and obese people and those with normal kidney function. Evidence is also mounting for its efficacy in gestational diabetes, although safety concerns still preclude its widespread use in this setting. It is also used in the treatment of polycystic ovary syndrome and has been investigated for other diseases where insulin resistance may be an important factor. We are offering Trajenta to our clients. Get emergency medical help if you have any of these signs of an allergic reaction: hives; difficulty breathing; swelling of your face, lips, tongue, or throat. Runny or stuffy nose, sore...Linagliptin is a white to yellowish, not or only slightly hygroscopic solid substance. It is very slightly soluble in water (0.9 mg/mL). Linagliptin is soluble in methanol (ca. 60 mg/mL), sparingly soluble in ethanol (ca. 10 mg/mL), very slightly soluble in isopropanol ( < 1 mg/mL), and very slightly soluble in acetone (ca. 1 mg/mL). 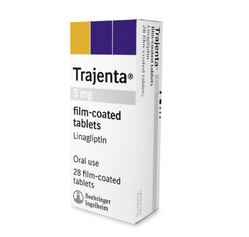 Each film-coated tablet of TRADJENTA contains 5 mg of a linagliptin free base and the following inactive ingredients: mannitol, pregelatinized starch, corn starch, copovidone, and magnesium stearate. In addition, the film coating contains the following inactive ingredients: hypromellose, titanium dioxide, talc, polyethylene glycol, and red ferric oxide. We are the Leading suppliers of Dapagliflozin Tablets. We also do Drop shipping. This combination medication is used with a proper diet and exercise program and possibly with other medications to control high blood sugar. It is used in patients withtype 2 diabetes. This product contains 2 medications. Sitagliptin works by increasing levels of natural substances called incretins. Incretins help to control blood sugar by increasing insulinrelease, especially after a meal. They also decrease the amount of sugar your livermakes. Metformin works by helping to restore your body's proper response to theinsulin you naturally produce. It also decreases the amount of sugar that your liver makes and that your stomach/intestines absorb. Januvia is sometimes used in combination with other diabetes medications, but is not for treating type 1 diabetes.You should not use Januvia if you are in a state of diabetic ketoacidosis (call your doctor for treatment with insulin).You should not use Januvia if you are allergic to sitagliptin, or if you are in a state of diabetic ketoacidosis (call your doctor for treatment with insulin). Januvia is not expected to harm an unborn baby. Tell your doctor if you are pregnant or plan to become pregnant. Your name may need to be listed on a Januvia pregnancy registry when you start using this medicine. Januvia is not approved for use by anyone younger than 18 years old. 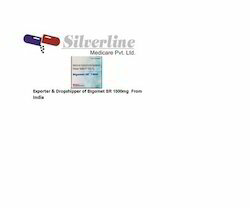 Sitagliptin is used to control blood sugar levels in patients with type 2 diabetes mellitus.Sitagliptin belongs to class of medications called dipeptidyl peptidase-4 (DPP-4) inhibitors.This medicine helps to improve the levels of insulin after a meal and decreases the amount of sugar made by the body. It works by increasing the amounts of certain natural substances that lower blood sugar when it is high.Stuffy or runny nose and sore throat, Hypersensitivity reactions., Joint pain, Upper respiratory infection, Muscle pain, Inflammation of nose, Constipationkidney problems vomiting, Throat or chest, Inflammation of bones, Common: low blood sugar, Interstitial lung disease, Back pain, Dizziness, HeadacheMetformin is an antidiabetic medicine that helps to control blood sugar in people with type 2 diabetes mellitus.Metformin belongs to class of medications called antidiabetics.It decreases the amount of glucose absorbed from the food and the amount ofglucose made by liver. Metformin also increases the body's response to insulin(a natural substance that controls the amount of glucose in the blood). Sitagliptin is a dipeptidyl peptidase-4 (DPP-4) inhibitor. It works by increasing the amount of insulin released by your body and decreasing the amount of sugar made by your body. treat diabetes mellitus by lowering glucose levels in the blood. With the exceptions of insulin, exenatide, liraglutide and pramlintide, all are administered orally and are thus also called oral hypoglycemic agents or oral antihyperglycemic agents. There are different classes of anti-diabetic drugs, and their selection depends on the nature of the diabetes, age and situation of the person, as well as other factors. Sitagliptin phosphate monohydrate is described chemically as 7-[(3R)-3-amino-1-oxo-4-(2,4,5trifluorophenyl)butyl]-5,6,7,8-tetrahydro-3-(trifluoromethyl)-1,2,4-triazolo[4,3-a]pyrazine phosphate (1:1) monohydrate. The empirical formula is C16H15F6N5O•H3PO4•H2O and the molecular weight is 523.32. The structural formula is:Sitagliptin phosphate monohydrate is a white to off-white, crystalline, non-hygroscopic powder. It is soluble in water and N,N-dimethyl formamide; slightly soluble in methanol; very slightly soluble in ethanol, acetone, and acetonitrile; and insoluble in isopropanol and isopropyl acetate. Please click on the link to the left to view the PIL in PDF format. Decreasing the amount of glucose and controls the amount of glucose in the blood. anumet contains a combination of metformin and sitagliptin. Metformin and sitagliptin are oral diabetes medicines that help control blood sugar levels. Janumet is not for treating type 1 diabetes.You should not use Janumet if you have liver or kidney disease, or if you are in a state of diabetic ketoacidosis (call your doctor for treatment with insulin). 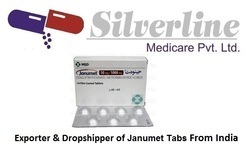 You should not use Janumet if you are allergic to metformin (Actoplus Met, Avandamet, Fortamet, , Riomet) or sitagliptin (Januvia), if you have kidney disease, or if you are in a state of diabetic ketoacidosis (call your doctor for treatment with insulin). Looking for Anti Diabetic Medicines ?